Thanks to everyone who tuned into my second Facebook live stream earlier this week. Overall, I think it went well. Got to make some cake and answer a few viewer questions. I was a little worse for wear since we’re currently going through a 5 month sleep regression with the baby (uuuuuuuggggggghhhhh), but was still able to string together coherent sentences. Success! Check out the live stream here: Vanilla Chiffon Cake & Whipped Ganache Live Stream. Have you tried the vanilla chiffon cake recipe yet? You can find it in full here: Vanilla Chiffon Cake. 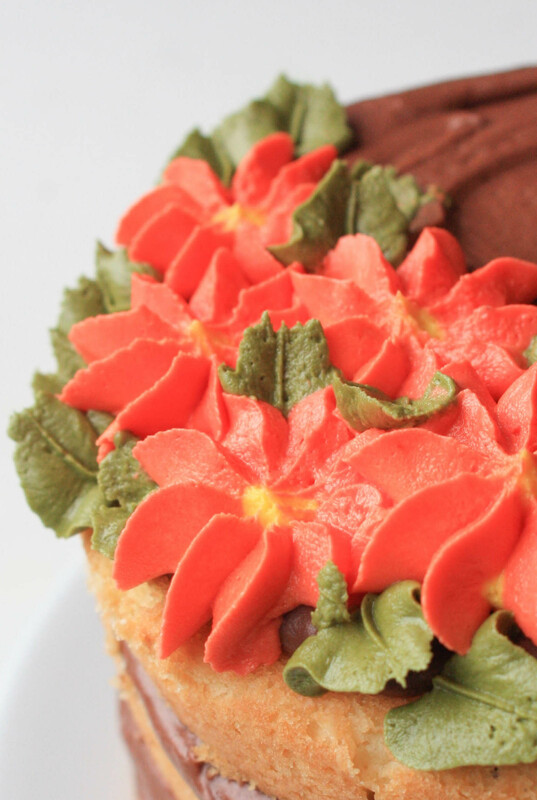 The recipe was a favorite at Wild Orchid Baking Co. and originally published in my first book, Great Cake Decorating. It’s also found on Fine Cooking.com along with a few others from the book. The whipped ganache frosting recipe can be found at the end of this post. It’s so easy and very versatile. Make it as rich or as sweet as you like – even within the same batch. The two recipes go together like peas and carrots. 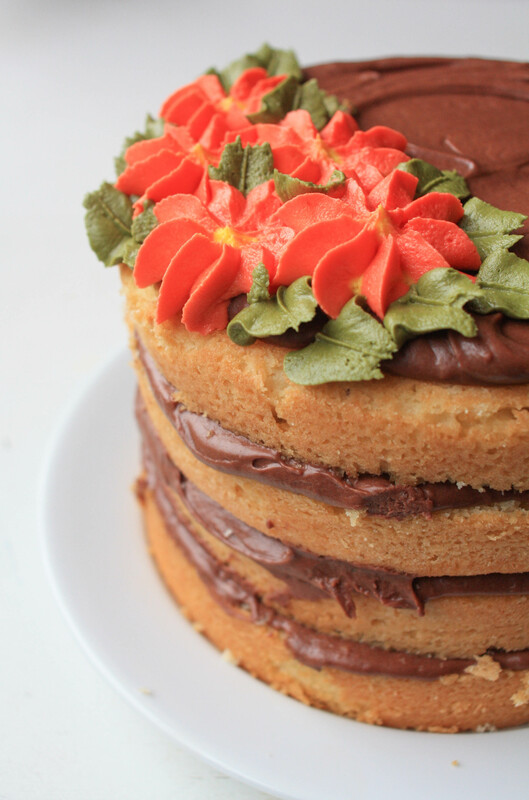 I mean, who doesn’t love classic vanilla cake with chocolate frosting? Last, but hardly least, those who stuck around to the end of the live stream got to see my fun and easy piped flower technique. I don’t have a written tutorial for that one, but may add it to the site if people are interested. Let me know in the comments if that would be helpful. Next up: HALLOWEEN! Muuuuahahahahaha! I. Love. Halloween! I’ll be live streaming next on my Facebook page Friday, October 16th, at 10am. 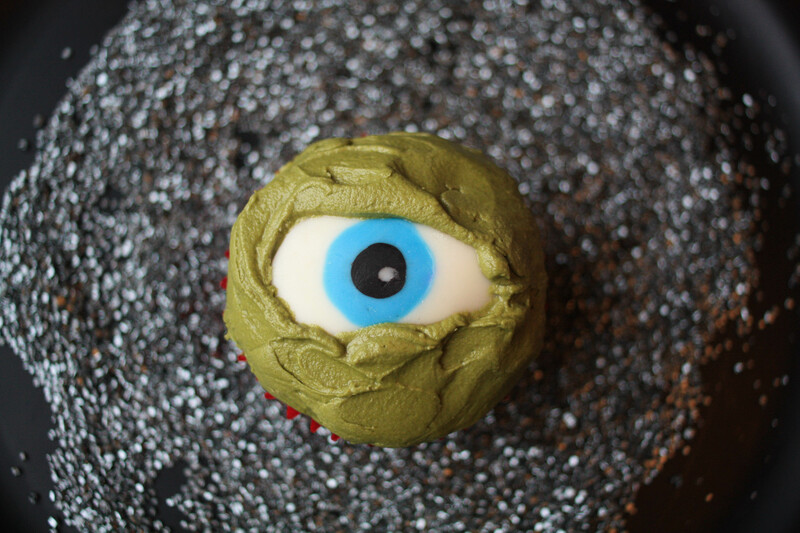 I’ll be demonstrating how to make these creepy chocolate eyeballs! Perfect for making monster (or dinosaur?) cupcakes. 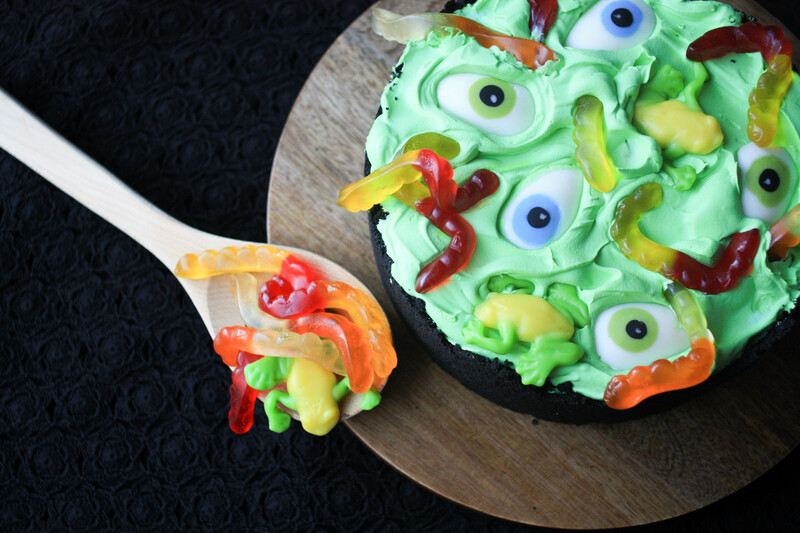 I also use them on this spooktacular cake (with a very witchy surprise inside), coming very soon to the blog! Keep your eyes peeled. Dark, decadent, and super versatile! This whipped ganache chocolate frosting will quickly become a favorite. Place the chopped chocolate into a heatproof bowl and set aside. Pour the heavy cream into a small sauce pan and bring to a simmer. Pull the cream off the heat just before it boils and pour it over the chopped chocolate. Let the cream and chocolate sit for a minute before stirring with a wooden spoon or spatula until combined. Let the ganache cool to room temperature before continuing, up to two hours. Pop the ganache in the fridge to quicken the process or if you want to finish the frosting at a later time. Ganache can be stored in the refrigerator in an airtight container for up to a week. Place the room temperature ganache in the bowl of a stand mixer fitted with a whisk attachment, or in a large bowl if you're using a hand mixer. Whip on medium for 2-3 minutes, or until the ganache is lighter in color and stands at stiff peaks. The frosting is now ready to pipe or spread. If you prefer a sweeter frosting, up to 4-cups of powdered sugar can be added to the whipped ganache. Add a cup at time until just combined.